A gentle, medical yoga practice united with holistic centered nursing. Learn our YogaNurse® signature program at home from any country in the world. YogaNurse is honored to be aligned with and endorsed by the distinguished Watson Caring Science Institute. Dr. Jean Watson and Dr. Kathleen Sitzman. When you Sign Up for the YogaNurse Training Essentials Home Study Course, you will Automatically become a Member of the YogaNurse Academy, where you will have access to our joyful, stress relief training course, the YogaNurse Community, Exclusive Content, Research, Updates & News, Career boosting and Money-Making Opportunities. You’ll feel centered, serene and radiant. Nurses, patients, or clients who are interested in therapuetic yoga BUT: Getting down on the floor in the work place isn’t practical, or injuries, knee surgery, weight issues, inflexibility and other challenges make getting on the floor uncomfortable. After you learn the self-care program for yourself, you can teach it to a massive health care market place. Hospitals and companies worldwide are drowning in rising healthcare costs, because of illness, stress, accidents, absenteeism and burnout! As a result, they’re losing money…and they’re looking for solutions. YOU provide the solution with our easy, proven stress relief program and bring it into the world of Workplace Wellness. I absolutely LOVED this course and I want more! I am excited to continue on with YogaNursing. I’ve noticed a dramatic change in my home yoga practice and this course has also given me the confidence/training to feel competent sharing what I learned with my family, friends, coworkers and eventually my patients. I look forward to growing with the YogaNurse Army. Annette has a pretty amazing story. She went from being a Top Model to ‪Yoga‬ Instructor to ‪Nurse‬. We often call ourselves “nurse entrepreneurs” yet it is misleading. An “entrepreneur” is one who innovates, creates something new. Annette is an entrepreneur in that she combined Yoga & Nursing to create the new nursing specialty of Yoganursing. Her mission is to teach, lead nurses into this new field, to build an “army” of Yoga Nurses. In reviewing her “Yoga Nursing Essentials” home study course, she gives all that she has to give, and over delivers as a rule. I will always admire her for that. There were many aspects I loved, the sutras especially, the flowing water and no obstruction and ease. The similarity you address between breath and spirit. I think it helps to assuage conflicts people have about Yoga being a religion that goes against Judeo-Christian theology. Sacred rest really helped me with my most challenging pose- savasana. Sacred breath helped me to get into my Tich Naht Hahn books on Mindfulness. Those are just the highlights off the top of my head but it’s a great movement. I’ll definitely serve as a YogaNurse “ambassador” and encourage nurses and RN students to check out the website. You have done amazing work for us nurses in this program…again thank you!!!! Bless you for this program! WOW!!! 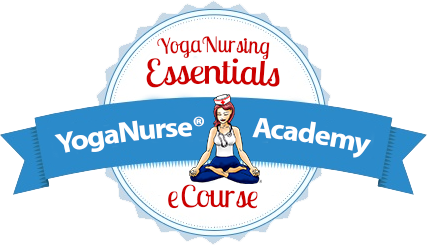 I am thrilled to be able to purchase the online Yoga Nurse Training! I’ve also begun some of the meditations and actually fell asleep because I was so relaxed NOT bored!!! I’ve also spoken to my VN school and they’d like me to begin to incorporate the Yoga Nurse program at school, not only for nursing students and staff, but also for other Allied Health students and staff…EXCITING things are about to happen!! I can feel it!! Yoga Nurse Essentials, a new offering by Annette Tersigni, is a powerful tool for self-examination, personal growth, and self-care. Geared towards nurses interested in holistic health and the YogaNurse model, this self-paced course allows the user to learn at his or her own pace, integrating the prescribed practices in an organic, self-directed fashion. Using the printed word, video instruction and audio files, different personal learning styles are accommodated. The varied structure and format make the learning process interesting, fun, flexible and participatory, while maintaining the integrity and cohesiveness of the material. Whether you’re a nurse who currently practices yoga or a nurse who is new to holistic models of care, I highly recommend Yoga Nurse Essentials, for both personal and professional growth. I have finished the lessons and your modules. I found it very rewarding and useful for my Mental Health Nursing. I plan to implement the structure with adolescent patients in my unit during nursing educational programs. Thank you for your support in Yoga Nursing. Hope to work with you. Lisbeth Overton,RN, Eden Prairie, MN. I took Annette’s Intro to YogaNursing training in Florida and was totally inspired. I then hired Annette for several consultations on how to position myself as a nurse entrepreneur and bring yoga therapy, stress management and back safety into my hospital and community. At the beginning of our consults, Annette told me she wanted me to rate our session between 1 and 10 and that she wanted a 10 out of 10. My rating— I said, ” How about an 11 or 12 out of 10!” Seriously. Both times Solid gold, generous, gifted advice! I’m now well on my way to living my dream. This is amazing!!! Thank you for going over and above and for all of your love and support! I feel blessed to have you in my life sharing your knowledge and wisdom. Thank you for creating this program. I know it will help me get to my nursing career goal, without an excuse. I will keep you posted on my progress. Namaste. Enroll Now and Get Free Lifetime Membership at the Yoganurse Academy which hosts loads of exclusive MEMBER-ONLY Content. When you Sign Up for the Course, you will instantly become a member of the YogaNurse Academy. What does your membership give you? 1. Access to the YogaNursing Training Essentials Study Material. 2. Research, News and Updates. 3. Exclusive Content to View/Download. 4. You will become part of a lucrative community of nurses who are making a difference in Nursing and are more than willing to support you along your journey in Yoga Nursing and as a Nurse Entrepreneur. 5. Access to our affiliate program that will allow you to earn a generous commission. 6. You will find many career boosting opportunities and ideas within the Academy. 7. You can access all this and complete the course from the comfort of your home. 8. Access the mobile-friendly ecourse from any device and study on the go!